2. Select "Internet Options" from the Tools menu. 1. In the Tools menu, Select [Internet Options]. 2. Select the [Security] tab. 3. Select [Custom level] to open the Security Settings dialog box. 4. Under Scripting | Active Scripting, select the [Enabled] option. 5. Select [OK] to close the Security Settings dialog box. 1. From the Macintosh file menu, select Explorer and then Preferences. 2. 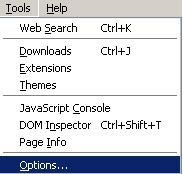 From the Web Browser menu options, select Java. 3. From the Java Options, Select the checkbox next to Enable Java. 4. Scroll through the options menu until you see the Receiving Files option. 1. 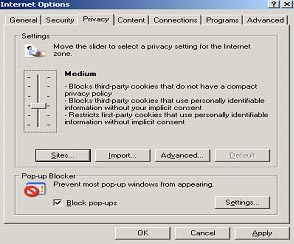 Open Netscape and Select Options from the Tools menu. 2. Select the Site Controls icon on the left panel. 5. Select the [OK] button. 6. Select & Select on the "Reload" button on your Netscape browser. 1. 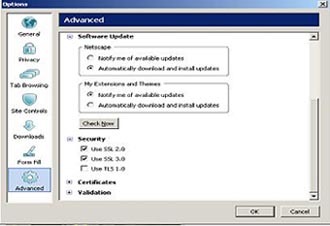 From the Edit menu (Windows) or Netscape menu (Macintosh), select Preferences. 2. From the Category menu, Select open the Privacy & Security category. 6. Select [OK] to apply changes and close the Preferences dialog. 1. Open the Tools menu and choose Options. 2. Under the Advanced menu Select the Security category. 3. Select the [OK] button to save your new settings. 1. Select Tools Internet Options. How Do I choose An Online ID? The Online ID should represent a name that you are most likely to remember. It may be a combination of your first and last name, or nickname that is unique to you. For Example: Smith1984 or JillAnderson68. Online ID cannot be more than 25 characters in length. Online ID must not have any spaces. Do not use your password as your Online ID. The use of special characters are not allowed, such as &%!@#*$. Minimum length should be 7 alpha numeric characters. You should choose a password that you can remember. Do not choose a password that somebody other than you can easily guess like your name and date birth or word password itself. Password can be a combination of any keyboard characters. Password must be minimum of 8 keyboard characters. Password should not be any data that is already entered in plain text in the User registration page. Restricted password repository will be used to restrict users from entering common words as password. Password will not expire. But, can be changed. If you already have an Online account with us, and you want to change the password, the new password cannot be the same as the last 4 passwords you have previously used. No spaces are allowed in password. No non keyboard characters are allowed. Select Sign In. You may also press the Enter key on your keyboard after entering the correct password. If you don't remember your Online ID select the Forgot Online ID to obtain your Online ID. If you forgot your password, select the Forgot Password to reset your password. Claimant If you are trying to file for Unemployment Insurance for New Jersey, you should select this role. Employer If you are a New Jersey based employer, you should select this role. Employer Agent If you are an employee of a New Jersey based employer, or you are the agent for a New Jersey based employer, you should select this role. The NJ-based employer can add you to their account after you register in this role. Select Forgot Online ID on the Sign In Page. Enter the Telephone Number that you gave us when you opened your Online account with us. If your account is found in our system, System will ask your security questions that you have answered when you opened an Online account with us. Your account will be deactivated after three failed attempts to answer the security questions correctly. If you gave answers to the security questions correctly, your Online ID will be displayed to you. Enter the correct password to sign into the system. Enter the Social Security Number and the Date Of Birth that you gave us when you opened your Online account with us. If you forgot your Online ID, you can search for your Online ID, using your email address that you gave us when you created an Online account with us. 2. The Telephone Number you gave us while opening your Online account with us. Enter the Federal Identification Number and the PIN that you gave us when you opened your Online account with us. If your account is found in our system, your Online ID will be displayed to you. Password and Online ID are used to Sign In to access New Jersey Department Of Labor internet application services. If you already have an Online account with us and do not remember your password, you can reset your password. Users can view the user account profile from the view profile page. This page is not directly accessible to the user from the login page. Select "View account profile" link on the application you have logged into to view the profile. Alternatively, you can also directly access the profile page through accessing web address: https://lwdsso.dol.state.nj.us/amprofile through your browser. Users can modify the user account profile from the modify profile page. This page is not directly accessible to the user from the login page. Select "View account profile" link on the application you have logged into to view the profile. Social Security Number , Date Of Birth, Federal Identification Number (Employees) , please contact us to talk to an Agent. In the User Profile application, select Change Password. This will initialize the Change password mode of the Profile. Place the Edit cursor on the field labeled Password and make necessary changes to the field data. You will have to confirm the password that you have entered in the previous field in the following field. Users can modify the security question(s) using the account profile on the modify profile page. This page is not directly accessible to the user from the login page. Select "View account profile" link on the application you have logged into to view the profile. This will initialize the Edit mode of the Profile. Place the Edit cursor on the field labeled First Name and make necessary changes to the field data. Place the Edit cursor on the field labeled Last Name and make necessary changes to the field data. In the User Profile application, select Modify Profile. Place the Edit cursor on the field labeled Middle Name and make necessary changes to the field data. Users can modify the Email address from the account profile on the modify profile page. This page is not directly accessible to the user from the login page. Select "View account profile" link on the application you have logged into to view the profile. Select Modify to bring up modify profile page. Make necessary changes to the required fields and select submit to save the changes. Alternatively, you can also directly access the profile page through accessing web address: https://lwdsso.dol.state.nj.us/amprofile through your browser. .
Users can modify the Telephone Number from the account profile on the modify profile page. This page is not directly accessible to the user from the login page. Select "View account profile" link on the application you have logged into to view the profile. Select "Modify" to bring up modify profile page. Make necessary changes to the required fields and select submit to save the changes. This is the security standard that this website uses to ensure that your data and identity are protected. This is the security standard that this website uses to ensure that your data and identity are protected. Passwords also should be alphanumeric because they offer better security and are harder to guess. Online account is your internet account with us. To create an Online account, using your computer mouse , select on First Time User? Click Here button. You may also use the Tab key on your keyboard to access this button and press the Enter Key. You will then be directed to a User Account Registration page. After completion of the registration, you will create a one time Online ID and password. Always Use this Online ID and password to access our application services. There is no need to obtain a new Online ID and password every time you visit this website. Online ID is the 8 to 35 Character Identifier (ID) that was created by you while creating the Online Account. This ID is unique to our system for each account held by us. This ID is paired with password. Enter the Online ID and password you have created to Sign In to access our application services. Enter Key on the Sign In / Log In page . You may also use the pointing device (Mouse) to click on this button. password followed by the new password you want it to be changed to. is same in both the password and confirm password fields on the form. The New Jersey Department Of Labor has several internet application services. Role is permission to access these application services. Such permission are also called as Authorization. Under normal internet application service flow, the Role is assigned by the application service when you try to access the service. However, there could be cases, where you as a beneficiary of the service have to choose a role yourself. please select an appropriate role based on the service you like to obtain from us. There is no need to register again if you have registered with us in a role. Please see "How to add more Roles to my profile?" Claimant: If you are trying to file for Unemployment Insurance for New Jersey, you should select this role. Job Seeker: If you are looking for employment in the State of New Jersey, you should select this role. Student: If you are a student attending school, you should select this role. Employer: If you are a New Jersey based employer, you should select this role. Employer Agent: If you are the agent for a New Jersey based employer, you should select this role. The NJ-based employer can add you to their account after you register in this role. Workers Compensation: If you are an attorney or an employee at attoneys' office who has been issued a Personal Identification Number for using Courts Online application, please select this role. . Claimant is a type of service user. New Jersey Department of Labor provides several application services, that serves different types of internet application service user community. Claimant is one such user community that will have access to internet application services like filing for Unemployment Insurance claim, Disability claim , Family Leave Insurance etc. If you are being asked for your Social Security Number, you have tried to access an internet application service that requires us to identify you before we render you any services. We use encrypted communication called Secured Socket Layer (SSL over HTTP) between client browser and our servers for transmission of data between your computer and our server. This eliminates your personal data hacked during transmission by third party. If you wish not to give this information over the internet, call us to contact an Agent. Telephone Number and Email address lets us reach you in case we have to contact you for speeding up processing of the service you have requested. We encourage you to give us this information when you create an Online account with us. However, we understand that not all users have access to internet and thus to an email address. You may choose to leave the email address field blank and proceed to the next field if you do not have one. We require you to enter a Telephone Number. This is a mandatory field. However, under certain circumstances, if you do not have a telephone number, please type 999-999-9999 in the field and proceed to the next field. We encourage you to update your profile with the correct telephone number when you get one. Security Questions are an additional form of security for your Online account with us. We ask you two security questions when creating an Online account. Select the two questions that you can relate to. Answer to these questions in the Answer field below it. You can change your security question by using up and down arrow keys. You may also scroll using a pointing device like a computer mouse. What is the purpose of the code that has numbers and letters? Security Code is an additional form of security for the internet application. We ask you to enter this code to ensure that the User account registration process is done by an individual. But, not from a robotic script run by a computer. You are asked to enter code at the bottom of an account registration page. a character image is displayed. in the image into the field labeled Please Enter the code:. We don't require this information as we use Social Security Number, Date Of Birth or similar Individual/Business data to validate your identity when required. This information if required will be requested by application service area in a separate web application form. Middle Name is not a mandatory field. If you do not have a middle name or initial, you may chose to leave this field blank. select More Search Options to lookup the Online ID. If you do not have an Online Account with us, you may create one with us any time. Select First Time User? Click Here on the Sign In Page. You can access Sign In Page by selecting Sign In Link on top right corner. You will need following information to create an Online Account. Online ID is used to Sign In to access New Jersey Department Of Labor internet application services. You should be in Sign In page to search for Online ID. Sign In page can be accessed by Selecting Sign In link on top right. To change/modify your account profile information, select on Modify Profile item on the Left Menu. Edit the required field and select Submit to save your changes. Following fields in the form are not editable due to security reasons. To make changes to above fields, please contact us to talk to an Agent. To change/modify your password, select Modify Password item on the Left Menu. Enter new Password in field labeled New Password and Confirm New Password and select Submit to save your new password. To change/modify your Security questions, select Change Security Questions item on the Left Menu. Select different Security questions from the drop down items and enter related answer in the Answer field. When you are done, select Submit to save your changes.